With endless to-do lists, sometimes it's hard to get a little me time, but this is one righteous endeavor that's worth the effort. 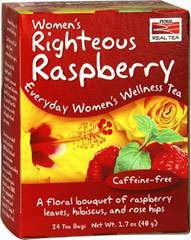 Stay in the pink with NOW Real Tea® Women's Righteous Raspberry, a fantastically feminine refreshment that combines raspberry leaves, rose hips, fenugreek, hibiscus and more to create the perfect floral fantasy and the ultimate women's tea for every stage of life. It's the Righteous Raspberry for women. When you hear the word bacteria, the first image that comes to mind might not be pleasant. But these microorganisms are not all bad news. There are plenty of friendly bacteria in your body—and they are called Probiotics. No Artificial Color, Flavor or Sweetener, No Preservatives, No Sugar, No Starch, No Soy, No Gluten, No Wheat, No Fish. Sodium Free.